Pressure ulcer (PU) is common in immobile elderly patients, and there are some research works to investigate a preventive and curative method, but not to find sufficient effectiveness. The aim of this study is to clarify the clinical effectiveness on wound healing in patients with pressure ulcer PU by molecular hydrogen-dissolved in water (HW) intake via tube-feeding (TF). Furthermore, normal human dermal fibroblasts OUMS-36 and normal human epidermis-derived cell line HaCaT keratinocytes were examined in vitro to explore the mechanisms relating to whether molecular hydrogen plays a role in wound-healing at the cellular level. 22 severely hospitalized elderly Japanese patients with pressure ulcer PU were recruited in the present study, and their ages ranged from 71.0 to 101.0 (86.7 ± 8.2) years old, 12 male and 10 female patients, all suffering from eating disorder and bedridden syndrome as the secondary results of various underlying diseases. 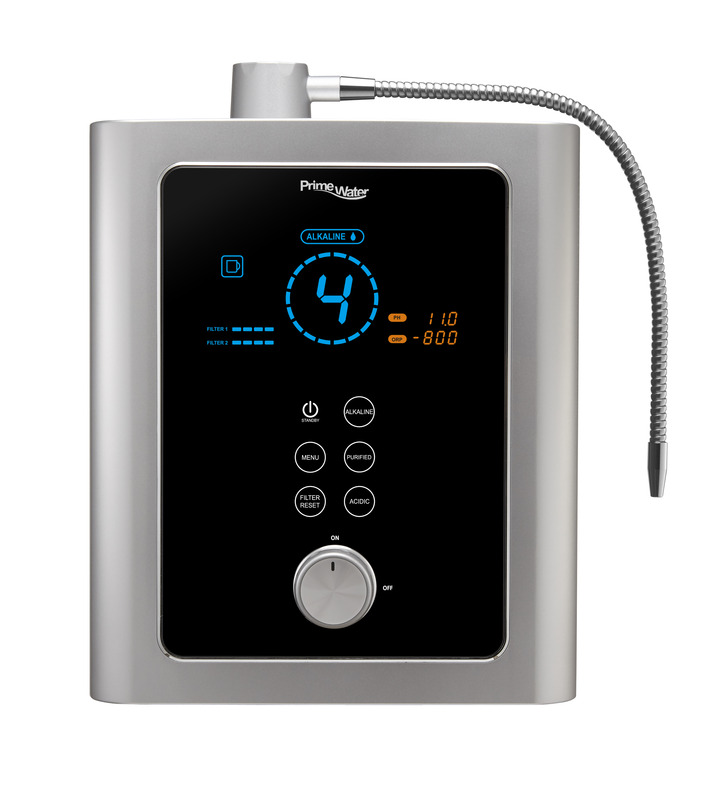 All patients received routine care treatments for pressure ulcer PU in combination with molecular hydrogen water HW intake via TF for 600 mL per day, in place of partial moisture replenishment. On the other hand, HW was prepared with a hydrogen-bubbling apparatus which produces molecular hydrogen water HW with 0.8-1.3 ppm of dissolved hydrogen concentration (DH) and −602 mV to −583 mV of oxidation-reduction potential (ORP), in contrast to reversed osmotic ultra-pure water (RW), as the reference, with DH of < 0.018 ppm and ORP of +184 mV for use in the in vitro experimental research. In in vitro experiments, OUMS-36 fibroblasts and HaCaT keratinocytes were respectively cultured in medium prepared with molecular hydrogen water HW and/or reversed osmotic ultra-pure water RW. Immunostain was used for detecting type-I collagen reconstruction in OUMS-36 cells. And intracellular reactive oxygen species (ROS) were quantified by NBT assay, and cell viability of HaCaT cells was examined by WST-1 assay, respectively. 22 patients were retrospectively divided into an effective group (EG, n = 12) and a less effective group (LG, n = 10) according to the outcomes of endpoint evaluation and the healing criteria. Pressure Ulcers hospitalized days in EffectiveGroup were significantly shorter than in LessseffectiveGroup (113.3 days vs. 155.4 days, p < 0.05), and the shortening rate was approximately 28.1%. 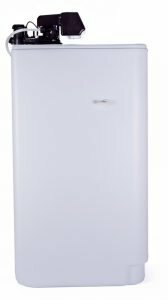 Either in EG or in LG, the reducing changes (EG: 91.4%; LG: 48.6%) of wound size represented statistically significant difference versus before molecular hydrogen water HW intake (p < 0.05, p < 0.001). The in vitro data demonstrate that intracellular ROS as quantified by NBT assay was diminished by molecular hydrogen water HW, but not by reverse osmosys water ultraviolet-A (UVA)-irradiated HaCaT cells. Nuclear condensation and fragmentation had occurred for UVA-irradiated HaCaT cells in reverse osmosis water RW, but scarcely occurred in molecular hydrogen water HW as demonstrated by Hoechst 33342 staining. Besides, under UVA-irradiation, either the mitochondrial reducing ability of HaCaT cells or the type-I collagen construction in OUMS-36 cells deteriorated in reverse osmosis water RW-prepared culture medium, but was retained in molecular hydrogen water HW-prepared culture medium as shown by WST-1 assay or immunostain, respectively. molecular hydrogen water HW intake via TF was demonstrated, for severely hospitalized elderly patients with PressureUlcers, to execute wound size reduction and early recovery, which potently ensue from either type-I collagen construction in dermal fibroblasts or the promoted mitochondrial reducing ability and ROS repression in epidermal keratinocytes as shown by immunostain or NBT and WST-1 assays, respectively. PressureUlcer is common in the immobile elderly or other immobile patients suffering from diseases such as spinal cord injury, amyotrophic lateral sclerosis, multiple sclerosis, and muscular dystrophy, etc. Furthermore, aged and weak bedridden patients belong to a high risk population for Pressure Ulcers . It is estimated that there are over one million elderly people who are suffering from the skin peculiarity and are facing the risk factors of Pressure Ulcers in USA . Fundamentally, it is usually pointed out that social, psychological and financial expenses for Pressure Ulcers are immeasurable, patients and their families as well as health care providers are always receiving the mental strain . For Pressure Ulcers , it is a primary research task to explore a cheap but effective preventive and curative method. Although various methods for prevention and treatment have been developed, they are far from sufficiently succeeding. While slightly delayed, basic studies are seen to steadily proceed in the same way as the clinical study. As the basic studies for wound healing, a lot of researchers are focusing on skin-constructing proteins such as collagen, elastin, laminin and fibronectin, and on metabolic activity and proliferating ability of dermal fibroblasts [4, 5]. In relation to this matter, we had confirmed the fact that molecular hydrogen-dissolved in water HW, as an external use for skin, can promote the construction of the type-I collagen in fibroblastic cells of dermis [6, 7, 8]. We prepared molecular hydrogen-dissolved in water HW with a hydrogen-bubbling apparatus, exhibited a DH of 1.13 ppm and an ORP of −741 mV, in contrast a DH of < 0.01 ppm and an ORP of +150 mV for normal water . Simultaneously, normal human dermal fibroblasts OUMS-36 and normal human epidermis-derived keratinocytes HaCaT were cultured using an immunostain, in addition, WST-8 and DAPI stains were conducted to examine the cytoprotective effects of molecular hydrogen-dissolved in water HW against UVA-ray irradiation. Six Japanese subjects were enrolled in a trial of molecular hydrogen water HW-bathing (DH, 0.2-0.4 ppm) every day for 3 months. 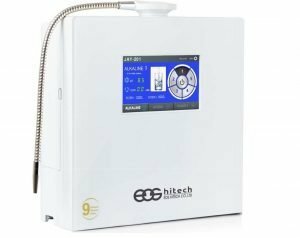 The results obtained showed that molecular hydrogen water HW-bathing significantly improved wrinkles on the back of the neck in four subjects on 90th day as compared to day 0. Thus the conclusion was achieved, in which molecular hydrogen water HW can serve as a daily skin care routine to repress UVA-induced skin damages by ROS-scavenging and promotion of type-I collagen synthesis in dermis. On the other hand, many basic research studies demonstrated that molecular hydrogen water HW is widely applied to various diseases, as an oral intake for absorbing via the gastrointestinal tract [9, 10, 11, 12, 13, 14]. 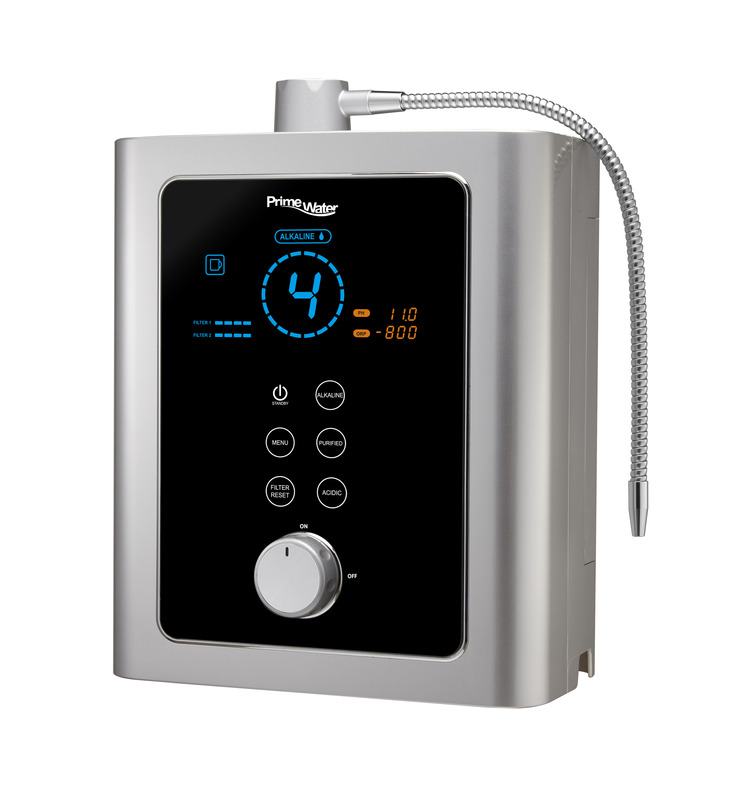 The researches obviously suggest that whether using a bathing type or oral intake type of treatment,molecular hydrogen water HW is still an effective method to repair the skin and scavenge the ROS [15, 16, 17]. We theorized that a routine care treatment in combination with molecular hydrogen water HW intake via TF for patients with PressureUlcers may improve wound healing and maintain a better health condition than before. The purpose of this study is to clarify the clinical effectiveness of wound healing for patients with PressureUlcers by means of an oral intake of molecular hydrogen water HW via TF. Furthermore, OUMS-36 cells and HaCaT cells were examined to analyze the mechanisms relating to whether molecular hydrogen water plays a role in wound healing at the cellular level, in vitro. Medical record data that were analyzed for this study were obtained from twenty-two elderly Japanese patients with Pressure Ulcers who were hospitalized and institutionalized in Kobayashi Hospital, Fukuyama City, Hiroshima Prefecture, Japan, which is a general hospital attached to a mixed long-term care facility. 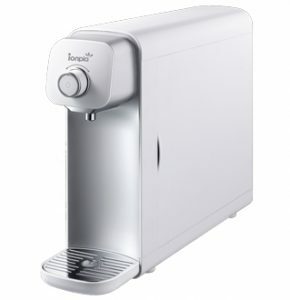 This study was approved by the Ethics Committee of Kobayashi Hospital. The ages of PressureUlcers patients who we treated in this study ranged from 71.0 to 101.0 (86.7 ± 8.2) years old, and ten patients were women. On the time of admission, they had suffered from one or multiple diseases and complications, and almost all of them were bedridden elderly people at a high risk of PressureUlcers development, and all of them could not eat without other people’s aid. On the time of admission or during the hospitalization, all patients had been or were gradually appearing symptoms of PressureUlcers. The types of diseases and complications in these patients, not only included eating disorder but 90% also showed the prevalence of being in the aged period, and 100% had impaired mobility. However, it must be emphasized that PressureUlcers incidence of new onset in Kobayashi Hospital remained approximately 2.10% in 2010–2011, persisted in low level. Because it was reported that average PressureUlcer incidence was 2.43% in a nationwide survey executed by Japanese Society of Pressure Ulcers . Twenty-two patients were retrospectively grouped into EG (effective group, n = 12) and LG (less effective group, n = 10) according to the outcomes of endpoint evaluation and the healing criteria. Details with regard to the discharge from hospital for whether cure or not were analyzed, and baseline data were summarized (Table 1). In data processing, results of all patients were classified as stage I-IV according to the Guideline in 2009 of EPUAP (European Pressure Ulcer Advisory Panel) & NPUAP (National Pressure Ulcer Advisory Panel) that is used as assessment for the severity of PressureUlcers. Coincidentally, all patients in this study belonged to stage II or III. Abbreviations: PU pressure ulcer, COPD chronic obstructive pulmonary disease, CIS cerebral infarction sequela, DESIGN-Ratingdepth, exudate, size, inflammation/infection, granulation, necrotic tissue. *Some patients had multiple locations for pressure ulcers. Keeping the ulcer area clean and covered, and not letting it dry out. Body-position changes at least every 2 hours if the patient is confined to a bed, or as often as every 15 min if sitting in a wheelchair. To achieve positive nutritional nitrogen balance, patient consumed by TF approximately 30 to 35 calories per kg per day and 1.25 to 1.50 g of protein per kg per day. 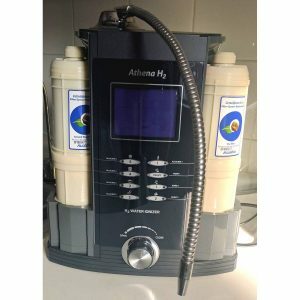 HW molecular hydrogen water was prepared with a molecular hydrogen-bubbling apparatus which consists mainly of a water supply section for manufacturing reverse osmosis water RW with less 0.018 ppm of DH and +184 mV of ORP, and molecular hydrogen water HW with 0.8-1.3 ppm of DH and −602 mV to −583 mV of ORP. For comparing molecular hydrogen water HW with reverse osmosys water RW, the water characteristic parameters were measured with the different dilution rates (Table 2, Figures 1 and 2). It must be emphasized that some stable characteristic indicators and the proprieties for innocuity and harmlessness of molecular hydrogen water were obtained from several separated in vivo and human experiments which we had reported [19, 20, 21, 22, 23]. 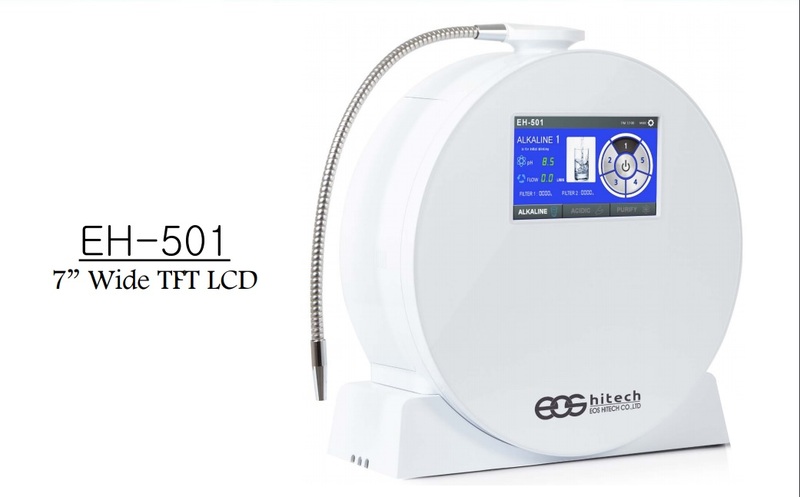 Meanwhile, via tube-feeding, Pressure Ulcers patients were enforced to intake molecular hydrogen water HW of 600 mL per day, in the morning and afternoon for approximately one hour, respectively, immediately after molecular hydrogen water HW was manufactured everytime. Abbreviations: DHdissolved hydrogen concentration, DOdissolved oxygen concentration, ORPoxidation-reduction potential. Measurement results of diluting molecular hydrogen water HW with reverse osmosys water RW. The dilution rates are showed as Figure 1. Figures 1–a and –b show the ever-increasing tendencies on DO (dissolved oxygen concentration) and ORP (oxidation-reduction potential). Meanwhile, as shown by Figures 1–c and –d, DH (dissolved hydrogen concentration) shows the ever-decreasing tendency which indicates the dissolved hydrogen in the hydrogen water was evaporated slowly by mixing with normal regular water. 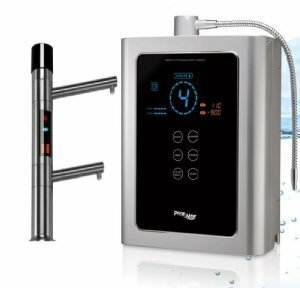 On the other hand, both molecular hydrogen water HW with reverse osmosys water RW have been holding the temperature range of 23.2-24.1°C and pH 7.37-7.48 no matter from 1 to 11-fold dilution rate. The evaluative indices for clinical therapeutic effects on PRESSURE ULCERS consisted of the hospitalized days, wound size, classifications of PressureUlcers-stage and DESIGN- rating. Because the increased length of hospitalized stay is an important index for a PressureUlcers patient of QOL (Quality of Life), the days from admission to discharge for twenty-two patients were counted. For obtaining precise objective information and monitoring the healing degree about wound, the medical-care staff measured the size, depth and area , utilized photography and diagrams for recording the shape and outline of the wound. According to a well-known Panel Guideline established by EPUAP and NPUAP in 2009 , stage II includes the partial thickness for loss of skin involving epidermis, dermis or both. The ulcer is superficial and presents clinically as an abrasion or blister, but is not deeper than the dermis. On the other hand, stage III involves the full depth of the skin, and may extend into the subcutaneous tissue layer which has a relatively poor blood supply and can be difficult to heal [25, 26]. DESIGN was an absolute evaluation tool and consumed as a clinical indicator to assess the quality of medical care. But, its score could not be compared the severity of PressureUlcers among different patients and their various ulcers. Because of this, the DESIGN-rating was invented to use as a simple and easy assessment of PressureUlcers [27, 28]. In our study, the DESIGN-rating score of every patient was recorded by the medical-care staff, at least once monthly. OUMS-36 cells were cultivated for 18 hours in molecular hydrogen water HW or reverse osmosys water RW-prepared Dulbecco’s modified Eagle’s medium (DMEM; Nissui Pharmaceutical Co. Ltd., Tokyo) supplemented with 10% FCS (fetal calf serum) (GIBCO) in a CO2incubator to be kept at 37°C and pH 7.1-7.4 in a moistened atmosphere of 5% CO2. The spent medium was replaced by the fresh molecular hydrogen water HW or reverse osmosys water RW-prepared culture medium, and was at once irradiated with UVA ray at doses of 12 or 18 J/cm2, corresponding to the normal dose range for the human daily life. The resultant cells were stained for the nuclei with 4′,6-diamidino-2-phenylindole dihydrochloride (DAPI, Ultracruz Mounting Medium, sc-24941, Santa Cruz Biotechnology Inc., Santa Cruz, CA), and observed for type-I collagen reconstruction by immunostain using the first antibody directed against type-I collagen and the secondary antibody conjugated with FITC (fluorescein isothiocyanate), as observed with a fluorescence microscope (ECLIPSE E600, Nikon Corp., Tokyo) as previously described . HaCaT cells were similarly cultivated in molecular hydrogen water HW or reverse osmosys water RW-prepared DMEM supplemented with 10% FCS (GIBCO), and similarly UVA-irradiated. The resultant cells were examined for cell viability by WST-1 methods using (phenyl)-5-(2-disulfophenyl)-2H-tetrazolium, monosodium salt as a redox indicator, and for ROS such as superoxide anion radicals by NBT (nitro blue tetrazorium) assay as previously described . Either clinical study or in vitro research, the Student’s t-test was used to compare the difference in means ± SD between the control and treated groups using a Microsoft Office Excel 2010 software (Microsoft, Albuquerque, NM, USA) or a software package SPSS 11.0 (SPSS inc., Chicago, IL, USA) for Windows. A p-value that is below 0.05 was regarded to be statistically significant. For the PressureUlcer patients, the hospitalized days in EffectiveGroup were significantly shorter than in LesseffectiveGroup (113.3 days vs. 155.4 days, p < 0.05), and the PressureUlcers reduction rate was approximately 28.1% (Figure 3-a). Likewise, DESIGN-rating in EG was also decreased for comparing the onset with the endpoint (11.5 rates vs. 14.3 rates, p < 0.05) between pre-post evaluations including both in onset (evaluation in the initial time, at the day for the admission to hospital) and in endpoint (evaluation in the last time, at the day for the discharge from hospital or death day). In LG, no statistically significance was seen, in DESIGN-rating indicative of degree of severity for PU, between both of them (Figure 3-b). Comparison of PU clinical effects for the hospitalized days and the DESIGN-rating in the effective group and in the less effective group. Figure 3–a shows the period for the PU hospitalized days in EG was significantly shorter than in LG. Figure 3–b indicates that the DESIGN-rating in EG was decreased for comparing the onset with the endpoint. Pre-post evaluations were performed, where the onset and the endpoint were included. All values are statistically compared. Statistical analysis was performed using Student’s t-test, and the significant differences are defined as p < 0.05. The data are presented as the means with the standard deviation (± SD, indicated by the vertical bar). * p < 0.05. Wound measurement is an important means to know the degrees of PU, and its measuring method was demonstrated in Figure 4-a (Figure 4-a). Either in EG or in LG, the reducing changes (EG: 91.4%; LG: 48.6%) of the wound sizes represent a statistically significant difference (p < 0.05, p < 0.001). Similarly, a significant difference is also seen between both EG and LG groups (p < 0.05) (Figure 4-b). Measurement methods for wound size and results of wound size in the wound-size reductive change between both the groups. Figure 4–a demonstrates the wound measurement method. As a protocol, initially, measure the greatest length along the axial direction (head to toe), and then the greatest width along the transverse direction (side to side) using a centimeter ruler. Finally multiply distances of length and width to obtain an estimate of surface area in square centimeters (cm2). Figure 4–b indicates a statistically significant difference to the reducing change of wound size in two groups. Some patients had multiple locations for PU. Values are statistically compared. Student’s t-test, *p < 0.05, ***p < 0.001. For observing the clinical effects in many respects, including the hospitalized days, DESIGN-rating and wound size, EG and LG were subdivided to four subgroups according to classifications of PU-stages (see Methods (3)-3). As a result, in stage II, a period for hospitalized days in EG showed significantly shorter than in LG (87.5 days vs. 387.0 days, p < 0.001). Contrary to this, in two group, there was no significance statistically for hospitalized days in stage III (Figure 5-a) owing to diseases other than PU. Moreover, in EG, the DESIGN-rating obtained from subgroups of stage II and stage III depicted a statistically significant difference (p < 0.05) (Figure 5-b). Meanwhile, the diminishment for wound size within subgroups of stage II and stage III presents any statistical differences (Figure 5-c). In a conclusion, stage II and stage III ulcers of EG healed faster and more effectively than those of LG. Expression of various PU-assessment indices forcing on both stage II and stage III. Figures 5–a to –c imply very significant differences among four subgroups based on stage II or stage III. P-values calculated from Student’s t-test, * p < 0.05, ** p < 0.01, *** p < 0.001. Figure 6 showed the time-dependent wound-healing progress for an 85-year-old female patient with PressureUlcer. She was admitted to the hospital for suffering from PressureUlcer. Wound findings at onset included: location: sacrum; wound size (cm2): 20.8; stage: II; DESIGN-rating: 16. Four months after routine care treatment plus a combination with molecular hydrogen water HW intake via TubeFeeding, the crater nearly disappeared. Wound findings at endpoint (vs. of onset) included: wound size (cm2): approximately 0 (disappearance); stage: I (improve); DESIGN-rating: 6 (decrease) (Figures 6-a to -d). Results of a typical case on time-dependent wound-healing progress. An annual time-dependent wound healing progress for an 85-year-old female PressureUlcer patient is reported. She was admitted to the hospital seeking treatment to PressureUlcer. Figure 6–a demonstrates photographs for the time-dependent wound-healing progress obtained from the same patient. Figures 6–b to –d represent the decreased tendencies of wound size, DESIGN-rating, and stage, respectively. Figure 7 showed the time-dependent wound-healing progress for an 80-year-old male patient with PressureUlcer. His hospitalized period lasted 10 months and it could be divided into the two sub-periods. During the latter 5-month period, he received molecular HydrogenWater treatment in the addition to the routine care. The outcome shows an improved result (Figures 7-a, -b). Results of another typical case on time-dependent wound-healing progress. Similarly to Figure 6, Figure 7 also demonstrates a time-dependent wound healing progress, for an 80-year-old male PressureUlcer patient. Figure 7–a shows the features photographed at the former period for routine care treatment alone. 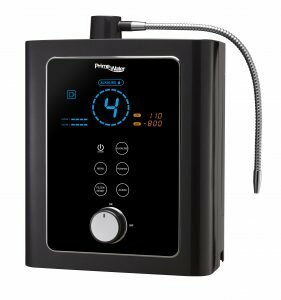 On the other hand, Figure 7–bpresents ones photographed at the latter period for routine care treatment plus molecular Hydrogen Water intake. The latter period in using HydrogenWater intake shows a marked improved outcome. To study the reconstructive effect of molecular hydrogen water HW on type-I collagen, we used immunostain on OUMS-36 cells that were irradiated with UVA ray and then were administered with reverse osmosis water RW or molecular hydrogen water HW in vitro, respectively. Representative expressions and pixel values were plotted with a software ImageJ (http://rsb.info.nih.gov/ij/). Nuclear condensation (so-called pycnosis) and fragmentation (so-called karyorrhexis) were occurred for UVA-irradiated OUMS-36 cells in reverse osmosis water RW, but scarcely occurred in molecular hydrogen water HW (Figure 8). HW molecular hydrogen water group shows higher proliferation of cells with rounded morphology in fibroblasts and huge morphology, and more abundant in type-I collagen than ones of reverse osmosis water RW group. Reconstructive effects of molecular hydrogen water HW in UVA-irradiated OUMS-36 cells. Figures 8–a, –b: Distributional expressions of type-I collagen with immunostain (green) in OUMS-36 cells that were irradiated with UVA ray and were administered with reverse osmosis waterRW or molecular hydrogen water HW, respectively. Figure 8–b: Each yellow dashed lines indicate type-I collagen-rich regions. Figure 8–c: Relative fluorescence intensity plotted with the ImageJ to present the pixel number. Type-I collagen stain on OUMS-36 cells that were irradiated with UVA ray and were administered with reverse osmosis water RW or molecular hydrogen water HW, respectively, is showed. Figure 8–d: The pseudocolor feature was plotted using ImageJ as an intensity which is corresponding to type-I collagen exhibition degree per one hundred cells (μm2/100 cells). Magnification: ×200; scale bars = 50 μm. Student’s t-test, *** p < 0.001. With fluorescence microscopy, DAPI dye can be excited by UVA ray. To examine the reconstructive effect of molecular hydrogen water HW on type-I collagen by immunostain, we also counterstaind nuclei with a DAPI dye in UVA-irradiated OUMS-36 cells for observing the changes when OUMS-36 cells were administered with Reverse osmosis Water or molecular hydrogen water HW in vitro, respectively. Representative expression and relative fluorescence intensity were plotted with the ImageJ. The facilitative effect on nuclear condensation and fragmentation was observed for UVA-irradiated OUMS-36 cells in Reverse osmosis Water , but scarcely occurred in molecular hydrogen water HW as demonstrated by DAPI staining as like the result obtained from immunostain (Figure 9). Through Figure 9-c, the degrees of DAPI stain on HaCaT cells that were irradiated with UVA ray and were administered with Reverse osmosis Water or molecular hydrogen water HW, respectively, were clarified. Features of nucleus-DAPI stain on UVA-irradiated HaCaT cells. Figures 9–a, –b: Distributional expressions of nucleus-DAPI stain (blue) in HaCaT cells that were irradiated with UVA ray and were administered with Reverse osmosis Water or molecular Hydrogen Water, respectively. Figures 9–c, –d: The relative fluorescence intensity and the pseudocolor feature for type-I collagen were plotted using ImageJ. Magnification: ×200; scale bars = 200 μm. Student’s t-test, *** p < 0.001. In HaCaT cells, the intracellular ROS amounts were increased in the Reverse osmosis Water -prepared culture medium with UVA-irradiation in different UVA ray doses, but were restored in the molecular hydrogen water HW-prepared culture medium as shown by NBT-stain for superoxide anion radicals. Cell morphology was observed to be more health and less harmful in molecular HydrogenWater than Reverse osmosis Water (Figure 10). Figure 10-e showed that NBT-stain was denser in dark-blue color in Reverse osmosis Water -administered cells than in molecular HydrogenWater-administered cells, indicating the intracellular ROS repression in molecular Hydrogen Water-administered cells. Intracellular ROS amounts in HaCaT cells as quantified by NBT assay. Figures 10–a, –b: The retained cell morphology and the diminished ROS were shown in molecular hydrogen water HW-prepared culture medium for comparing with Reverse osmosis Water .Yellow dashed lines indicate abundant dark-blue dyes that were the reaction products where ROS such as superoxide anion radical was found to react with NBT-stain. Figures 10–c, –d: The expressions of surface plotter by ImageJ. Figure 10–e: The mean gray values obtained from ImageJ used to express the increase or decrease in superoxide anion radicals within normal human epidermis-derived keratinocytes HaCaT according to NBT-stain. In detail, the vertical axis shows the brightness presented as a mean gray value, which is considered as an index to show the cellular stained intensity and use to indicate ROS amounts. The cell morphologies of Reverse osmosis Water RW and molecular hydrogen water HW were divided into the eight regions and then compared with their mean gray values by Student’s t-test (** p < 0.01). Magnification: ×200; scale bars = 100 μm. In HaCaT cells, the cell viability was obviously increased in the molecular hydrogen water HW-prepared culture medium with UVA-irradiation, comparing with reverse osmosis water RW-prepared culture medium by WST-1 assay (Figure 11-d). Cell morphology was also observed to be less vulnerable in terms of diverse symptoms such as cell shrinkage, nuclear condensation and cell fragmentation for molecular hydrogen water HW than reverse osmosis water RW (Figures 11-b, -c). molecular hydrogen water HW group showed higher proliferation of cells with rounded morphology and huge morphology, in HaCaT cells than ones of Reverse osmosis Water group. All of these evidences predicted that molecular hydrogen-dissolved water may exert cytoprotective effects against UVA ray on HaCaT cells. Results of cell viability of HaCaT cells as assessed by WST-1 assay. Figure 11–a: HaCaT cells are shown in the non-administered or non-UVA-irradiated status. Figures 11–b, –c: The morphologic features of HaCaT cells are shown in reverse osmosis water RW or molecular hydrogen water HW, respectively, after irradiation with UVA ray. Figure 11–d: The cell viability is shown for HaCaT cells after UVA-irradiation by WST-1 assay. Magnification: ×400; Scale bar = 100 μm. Student’s t-test, ** p < 0.01. The purpose of the present study was to examine the clinical effectiveness of wound healing for Pressure Ulcers using molecular hydrogen water HW intake via TubeFeeding. We have hypothesized that the routine care treatment in combination with molecular hydrogen water HW intake for PressureUlcer patients may improve wound healing, and maintain more healthy condition for them. Furthermore, normal human dermal fibroblasts OUMS-36 and normal human epidermis-derived keratinocytes HaCaT were examined to explore the mechanisms underlying to whether molecular hydrogen plays a role in wound-healing at aspect for cutis tissue, through in vitro experiments. 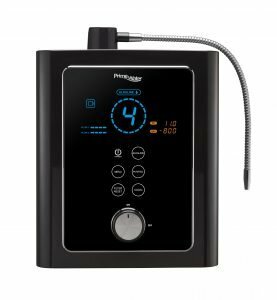 Our clinical results seem to suggest that molecular hydrogen water HW oral intake via TubeFeeding is an effective means for wound healing of PressureUlcer patients, who suffered from eating disorder. Despite the limitations caused by practicing our clinical intervention for PressureUlcers, we were able to obtain the improving results in hospitalized days, wound size and other clinical indices by comparing EG with LG. Therefore, we estimated that molecular hydrogen water HW absorbed by the gastrointestinal tract plays an important role in oxidative-stress reduction, extracellular matrix reconstitution, and anti-inflammatory effects. Several experiments have supported our considerations as follows. 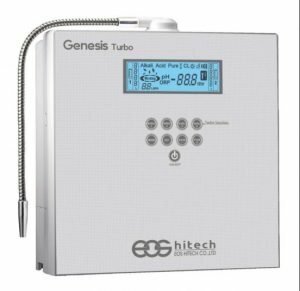 At first, it was demonstrated that molecular hydrogen gas (H2) has a beneficial influence on the gastrointestinal tract . Kajiya et al. established a mouse model of human inflammatory bowel disease (IBD) by supplying to mice drinking water containing a) 5% dextran sodium sulfate (DSS), b) 5% DSS and molecular hydrogen H2, or c) molecular hydrogen H2 only ad libitum up to 7 days. They found that on day-7, DSS-induced pathogenic outcomes including elevated levels of IL-12, TNF-α and IL-1- β in colon lesion, etc. were significantly suppressed by addition of molecular hydrogen H2 to DSS solution. Thereby, it was concluded that molecular hydrogen H2 can make an anti-inflammatory influence on gastrointestinal tract in vivo. Secondly, Nakashima-Kamimura et al. 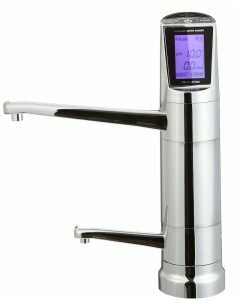 examined whether drinking water containing the saturated dissolved molecular hydrogen (HW: 0.8 mM molecular hydrogen H2 in water) is applicable by examining the effects of oxidative stress, mortality, and body-weight loss as well as serum creatinine, and blood urea nitrogen (BUN) levels. In in vivo experiments, their results showed that molecular hydrogen was detected in the blood when molecular hydrogen water HW was placed via gavage at a dose of 15 mL/kg in the stomach of a rat, and molecular hydrogen water HW is applicable to alleviate nephrotoxic side-effects induced by an anti-cancer drug, such as cisplatin . Thirdly, as molecular hydrogen gas can act as a scavenger of ROS, Cardinal et al. tested the effect of treatment with molecular hydrogen water HW in a rat model of kidney transplantation. In consequence, treatment with molecular hydrogen water HW improved allograft function, slowed the progression of chronic allograft nephropathy (CAN), reduced oxidant injury and inflammatory mediator production, and improved overall survival. Their conclusion was that molecular hydrogen water HW is an effective antioxidant and anti-inflammatory agent in vivo. It was previously shown that some free radicals inhibit the wound healing process . 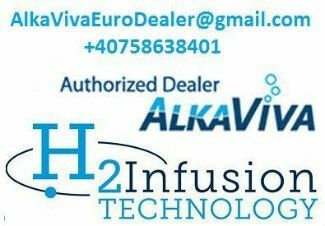 molecular hydrogen H2 is a colorless, odorless, tasteless gas, and it possesses some peroxidant reducibility. molecular hydrogen H2 is possible to easily pass through the small intestine villi into the human body inside and blood stream , because its molecular weight is the smallest of all molecule species, and it has gaseous and electrically neutral properties, as well as it shows a strong diffusion capacity. Moreover, molecular hydrogen H2 maybe has its special channels for transporting into intracellular space, such as the aquaporins (AQPs) for water, especially molecular hydrogen-holding water, and the Rhesus (Rh) proteins . Thus, coupled with the body itself and the enterogenous-H2 molecular hydrogen presence, due to specified intestinal bacteria, molecular hydrogen water HW intake via TubeFeeding can play an important role on improving the formation of wound granulates on disintegrated necrosis loci, and the ability to have an anti-inflammatory effect through an ROS-reduction mechanism. Additionally, it should be pointed out that apoptotic cells can stimulate proliferation, wound healing, and tissue regeneration . We are focusing on “the apoptosis-induced compensatory proliferation” which occurs in PressureUlcers . Generally, necrosis has an effect of the secondary lethal damage to the wound-surrounding cells of PressureUlcers through cell swelling and burst. By contrast, cell debris that is caused by cell shrinkage and fragmentation in apoptosis in which karyorrhexis (i.e. nuclear fragmentation) and pycnosis (i.e. nuclear condensation) are revealed as an early event, is subjected to endocytosis by both the migratory professional phagocytes (e.g.macrophages and Langerhans cells in the epidermis) and the surrounding non-professional phagocytes. So, it is thought that “the compensatory proliferation” is induced for the reason that cell debris is peaceably handled to restrain the surrounding cells within a minimal deteriorating impact. On this occasion, ROS may be able to be suppressed by the molecular hydrogen water to evoke an apoptosis more gently, and subsequently, apoptosis that is caused in wound-surrounding cells of PressureUlcers stimulates the compensatory proliferation to lead to an early healing. Indeed, Cai JM et al. reported that 2% molecular hydrogen gas inhalation administered to a neonatal hypoxia-ischemia rat model could reduce apoptosis . When molecular Hydrogen Water-intake via TubeFeeding was combined with routine care treatments, the wound healing process can be markedly accelerated. Hence, the effective mechanism of molecular Hydrogen Water possesses at least two possible pathways, firstly is an antioxidant effect and secondly is an anti-inflammatory effect. Moreover, we thought that molecular hydrogen water HW may have additional effects, i.e. reconstruction of collagen and cytoprotection for other dermal as well epidermal cells. Therefore, we carried out an in vitro experiment on normal human dermal fibroblasts OUMS-36 and normal human epidermis-derived keratinocytes HaCaT to examine their interaction. 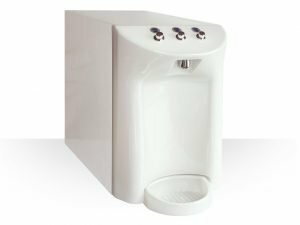 Therefore, either dermal or epidermal cells were respectively cultured in molecular hydrogen water HW or reverse osmosis water RW-prepared medium. Immunostain was used for observing type-I collagen reconstruction in OUMS-36 cells and showed the promotive effect. And cell viability of HaCaT cells was examined in terms of cell morphological observation and WST-1 assay, and their generated ROS, especially superoxide onion radials, was measured by NBT assay, respectively, all of which showed the cell-death-repressive and ROS-scavenging effects. We have attempted to draw the illustrations for assuming a cure mechanism from stage III to wound healing during Pressure Ulcers (Figure 12). 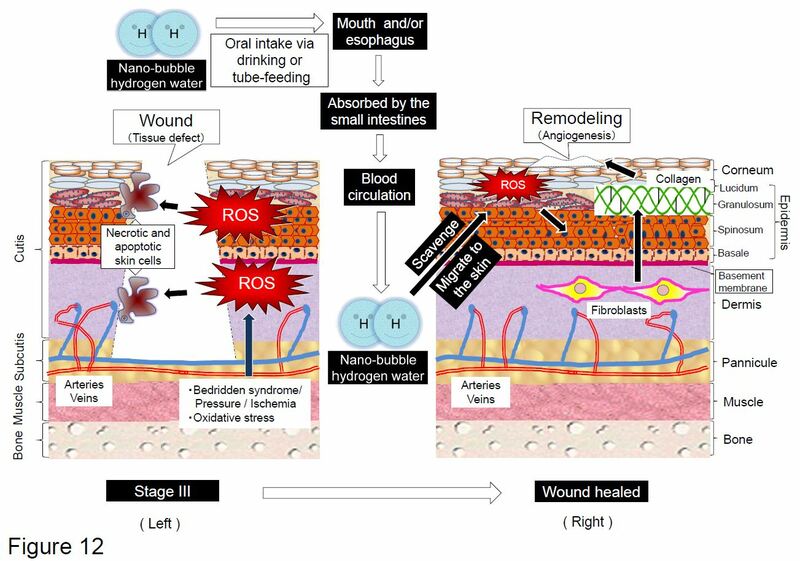 Mechanism for wound healing of pressure ulcer by molecular hydrogen-dissolved water. We are predicting that ROS can lead to a pressure ulcer, and the causative process is shown by the left illustration. First of all, such diverse factors as bedridden syndrome, mechanical pressure and local ischemia produce ROS which causes necrosis and apoptosis in combination with other pathologic factors, potently resulting in wounds and tissue defects of pressure ulcer. On the other hand, the right illustration shows the healing mechanism. 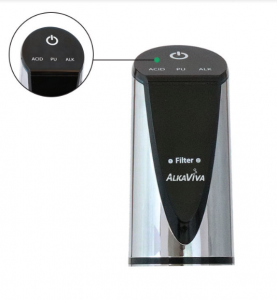 Oral intake of nano-bubble molecular hydrogen water via drinking or tube-feeding passes by the mouth or esophagus, and it is absorbed by the epithelial cells of the small intestines. It is possible that molecular hydrogen gas transpires in past from molecular hydrogen water HW and inhaled by the lung. Then, the absorbed nano-bubble molecular hydrogen migrates to cutis tissue through blood circulation and scavenges ROS abundantly generated in Pressure Ulcers. Finally, this process results in collagen reconstruction of fibroblasts in the dermis and the proliferation of keratinocytes in the epidermis, and causes angiogenesis and remodeling for repairs in the defected tissue. Consequently, our in vitro data demonstrated that intracellular ROS was diminished by molecular hydrogen water HW, but not by reverse osmosis water RW, in UVA-irradiated OUMS-36 fibroblasts. Nuclear condensation and fragmentation were occurred for UVA-irradiated OUMS-36 cells in reverse osmosis waterRW, but scarcely occurred in molecular hydrogen water HW as demonstrated by DAPI staining. Besides, in HaCaT cells, the mitochondrial dehydrogenase, especially succinate dehydrogenase activity was diminished in reverse osmosis water RW-prepared culture medium with UVA-irradiation, but was retained in molecular hydrogen water HW-prepared culture medium as shown by NBT and WST-1 assay. Thus, UVA-induced ROS, especially singlet oxygen and superoxide onion radicals were suggested to be scavenged by molecular hydrogen and result in cytoprotection against ROS-induced mitochondrial dysfunction. Similar results have been reported from previous research works on reconstruction of collagen in other dermal or epidermal cells by molecular hydrogen water HW [38, 39]. (3) the repair and restoration of scar tissues. 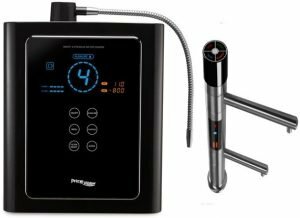 Healing effects for PressureUlcers patients through molecular hydrogen water HW oral intake via TubeFeeding as shown by our present study have been scarcely found in the past. Our experience in this study added further evidences to a possible role in medical therapies for Pressure Ulcers. 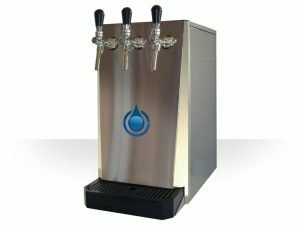 Additionally, as well known, there are different methods to manufacture the hydrogen water by diverse research groups, so there are also different water-parameters about molecular hydrogen water HW. In order to show our data obtained from measurements with the different dilution ratios, we had specially set up Figures 1 and 2, as well as Table 2 to present these achievements. 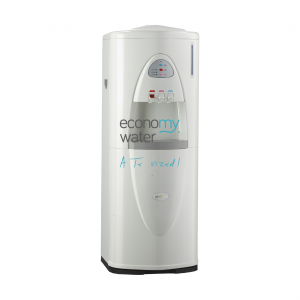 How to manufacture molecular hydrogen water HW and reverse osmosis water RW is an important and essential matter in the field of hydrogen water medicine. But, this study has some limitations that should be considered when interpreting the results. Firstly the study design could not be carried out as the randomized control trail (RCT), because generally PU-cure clinical intervention test cannot be executed as RCT owing to other diverse factors such as various diseases concurrence and complication. Clinical situation did not allow us to get clinical data prior to one as we designed. 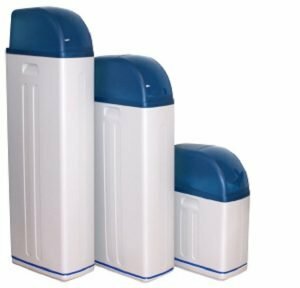 Secondly we could not design the trial into comparing the results both molecular hydrogen water HW oral intake and external washing of injurious sites with molecular hydrogen water HW, respectively. These deserve the next-step study. molecular hydrogen water HW intake via Tube Feeding was demonstrated, for severely hospitalized elderly patients with Pressure Ulcers, to execute wound size reduction and early recovery, both of which potently ensue from either type-I collagen construction in dermal fibroblasts or the promoted mitochondrial reducing ability and ROS repression in epidermal keratinocytes as shown by immunostain, NBT and WST-1 assays, respectively. Written informed consents that were presented from the patients for the publication of this report and any accompanying images were obtained and confirmed as the ethical clearance by the Ethics Committee of Kobayashi Hospital, Fukuyama City, Hiroshima Prefecture, Japan. The authors are grateful to Kobayashi Hospital and the representative director Dr. Yoshizi Kobayashi, for their devoted support to part of clinical trial. This study was supported, in part, by grant-in-aid from JCAAMS (Japanese Center for Anti-aging MedSciences, Hiroshima). Conducted and designed the experiments: QL NM. Performed the experiments: DM SK QL. Analyzed the data: QL NM. Contributed apparatus/reagents/materials: DM HT NM. Wrote the manuscript: QL NM. All authors read and approved the final manuscript.